Washington (CNN) - Republican presidential candidate Mitt Romney outlined his plan to shrink the size of government Friday, promising to cut spending levels to 20% of GDP by the end of his first term. To reach that goal, Romney said, the government must find $500 billion in annual savings by 2016. Speaking in Washington at the "Defending the American Dream Summit," a conference sponsored by the conservative group Americans for Prosperity," the former Massachusetts governor outlined a three-step plan for scaling back federal costs while also maintaining a robust commitment to military spending. "I will make the federal government simpler, smaller, and smarter by eliminating programs, by sending programs back to the states, and by making government itself more productive," Romney said. Romney won applause by pledging to slice funding to a litany of conservative bogeymen that receive federal funds, outfits like the National Endowment for the Arts, Amtrak and Planned Parenthood. The biggest cost-saver under his plan would be a proposal to let individual states manage Medicaid and limit the program's growth to the consumer price index, plus one percent. That would save the government $100 billion a year, Romney said. Enabling states to handle workforce training dollars would save "billions of dollars," he added. – Reducing foreign aid to countries that don't need it and countries "that oppose American interests." Democrats attacked Romney's plan earlier in the day. A memo released by President Barack Obama's re-election campaign Friday said the Romney plan would destroy Medicare and Medicaid, enact cuts that would hurt the middle class and provide tax breaks to corporations. "He would return American families to the failed economic policies that contributed to the years of rising inequality, stagnant wages, and eroding middle-class security," the memo said. In a web video, the Democratic National Committee said the plan by the GOP presidential candidate would seriously hurt middle class families, saying the plan was something "only a billionaire could love." Yeah because saving a corporation money will make us all lose our job! What a bunch of wackos you people are! Do you not realize that if you save companies money that expand their business and that does what create jobs! Or if you save them money you get pay raises and the cost of their products go down helping all of us! Don't get me wrong I don't want anyone to get rid of some of the social programs we because some people depend on that money, but we have to really look at who is taking advantage and who is not! As a country we can not keep spending money we don't haven and you haven't noticed half the world wants to kill us so defense. Should be the last thing we cut. If you really want to boost our economy call you liberal congress people and tell them we need to drill for our own oil. Why should give our money to countries that hate us? Could you imagine if we could get gas back down to about a 1 a gallon again how much money we would all have not to mention everything we buy has fuel costs attached to it so that would also make prices go down! This is common sense stuff here people. By the way did you know that oil is at 15 year low a barrel but yet we are still paying over 3 dollars a gallon??? And you say conservatives are big oil might want to reevaluate that one! This plan is straight out of the 1987 movie "Wall Street" with Mitt as Gordon Gekko. Where are the tax increases, MittWit? What sacrifices are you calling on Big Business and the filthy rich to share along with the rest of us? You are one sleazy, corrupt 1%er, you are. That's exactly what we need, an intelligent plan. If Romney gets elected, trust me, the economy will rocket back up, because there will be global confidence in reinvestment in all economies, starting with America's. Flip flopping? Not trustworthy? Big corporate lover? That's all stupid. I love the plan. Let's get this country back in shape! Go Mitt! Where the American middle class? Does flip flopper not even recognize us? Mitt Romney is the Republican GOP's version of Wall Street's Gordon Gekko. 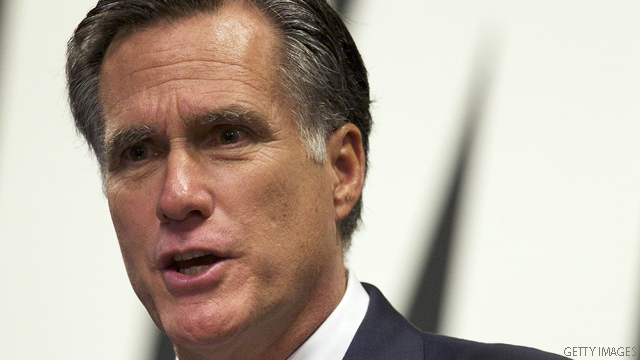 Mitt looks the part, acts the part, and he walks the walk of corporate raider Gordon Gekko. The life and trials of middle-class Americans trying to stave off foreclosure, banking disasters, college loans, and unemployment are not a concern of this corporate raider Mitt 'Gordon Gekko' Romney. Sounds like he will be shrinking our economy – we have done enough of that already at our state legislatures – don't people realize that government is actually a vital and healthy part of our economy? – we do have to pay for it with revenues though – Reagan and Bush greatly increased spending to GDP but then turned around and greatly cut revenues to GDP – thus 30 years of skyrocketing deficits and debt that have just kept piling on – Raise some revenues already – hire back the teachers and first responders – there's several hundred thousand jobs right there with huge multiplier effects for our economy – just waiting put there and sitting and collecting unemployment – just do the right thing and quit pampering the rich at the expense of everyone else. All you Libs have no clue. I thought at least some of you would have at least a little common sense. Willard is our only hope for getting someone in the white house that will balance the budget. Obama has already contributed to downgrades from S&P and Moody's and is taking us in the same direction as Greece. We need someone more than a socialist community organizer. Myth Romney the Bain of gop politics. so Romney want to move basically federal spending to State spending.... right... that would solve all problem Mittens... man what a f.. up this guy. In other words, kill Medicare and Social Security, increase foreign aid because the GOP will discover its easy to talk about cutting aid and another thing to do it when they will probably be contemplating an invasion of Iran; reducing the salary of a government worker to the level of a telemarketer ( $8-10 per hour will really incent them, right Mitt? ): what agencies would be combined, Mitt? Any specifics? He's nibbling at the margins in an effort to appear sane, which is not hard given the crackpot state of the GOP field. He is really not interested in doing anything, since you know he does not have the stomach for a prolonged fight with a Congress that won't trust him, no matter who is in charge. "Not everything is fair in this life." That slippery slope of reasoning leads to one conclusion only: 99% of the populace can kick the crap out of 1% of the populace. Who do you think gets the money then? Mitt is the only one that can save this country now, get over it, losers. That amount of money is laughable when Obama mpnths ago proposed a 4-trillion dollar cut, but Boehner backed out of the deal to protect the rich from paying their share.